The Coca-Cola marketing team became one of the best branding consultants in history thanks to its Christmas marketing campaigns. The first Santa ads used a strict-looking Claus, in the vein of Thomas Nast. In 1931 Coca-Cola company began placing ads in popular magazines. Coca-Cola branding consultants wanted the campaign to show a wholesome Santa who was both realistic and symbolic. Although it’s often said that Santa Claus red clothing is due to Coca-Cola, there’re some evidences that Santa appeared in a red coat before. 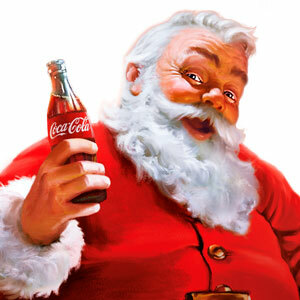 So Coca-Cola hired, Haddon Sundblom to develop advertising images using Santa Claus, a new image if him. Sundblom turned to Clement Clark Moore‘s 1822 poem “Twas the Night Before Christmas”. His’s description showed an a warm, friendly and very human man. Although it’s often said that Santa Claus red clothing is due to Coca-Cola branding consultants, there’re some evidences that Santa appeared in a red coat before. In the beginning, H. Sundblom designed the image of Santa using a real human model, his friend Lou, a retired salesman. Later, he started using old photographs to develop the final image of Coca-Cola Santa. It was the greatest succes of Coca-Cola branding consultants. The character became so likable, The Coca-Cola Company and Haddon Sundblom struck a partnership that would last for decades. Sundblom’s Santa appeared regularly in Ladies Home Journal, The Saturday Evening Post, National Geographic, The New Yorker and others. Over 33 years, Haddon Sundblom painted different versions of Santa Claus for Coke advertising and posters.